Now that you have a good sampling of basic Visual Basic syntax under your belt, it's time to tackle some of the more challenging topics. Classes are integral to the .NET Framework, particularly the .NET Framework Class Library. As a means of better understanding what classes are -- particularly as utilized in the .NET Framework -- we demonstrate how to create your own custom classes. 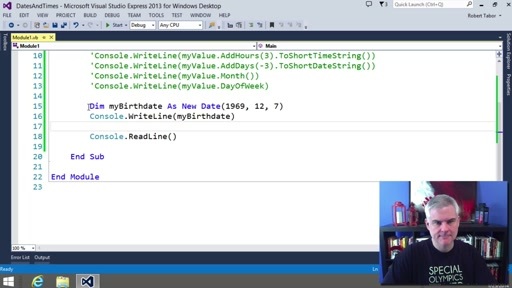 In this lesson we demonstrate how classes are defined and new instances are created. 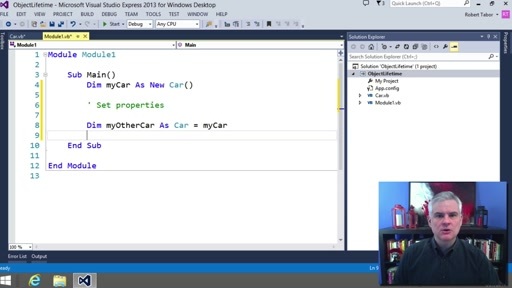 We demonstrate how to define Properties (using the prop "code snippet" to create auto implemented properties) and how to both set their values and get their values for a given instance of the class as well as creating Methods in our classes. We talk about how the classes you create are really custom dat types and can be used as such in helper method declarations and such.